Glaucoma is an eye disease that damages the optic nerve, leading to progressive loss of eyesight. It is often, but not always, associated with increased pressure of the fluid, called aqueous humor, inside the eye. Glaucoma is called "silent thief of eyesight" because it is in most cases developes in early stages without noticable symptoms. Untreated glaucoma leads to permanent damage of the optic nerve which then progress to blindness. Glaucoma, after cataract is the second leading cause of blindness worldwide. Glaucoma can be divided roughly into two main categories, "open-angle" and "angle-closure" glaucoma. Angle-closure glaucoma develops rapidly as a result of quickly rising pressure inside the eye. Iris, when dilating, is pushed forwad and to the outer edges creating closed angle with cornea and blocking passage of fluid (aqueous humor) from anterior chamber to trabecular meshwork, which drains the fluid to outside. Since gland keeps producing fluid it builds pressure inside the eye. Elevated pressure damages nerve cells in the optic nerve leading to vision loss. In case of Open-angle glaucoma drainage channels are not compressed by iris and should work properly, but they are clogged, like blood vessels clogged by cholesterol. But, similar to blood vessels blockage causing heart diseases, this happens slowly over time and causes unperceivable loss of eyesight. If you experience these symptoms let eye care professional check your eye as soon as possible. It might not be glaucoma, but if it is - early prevention is a key to stop disease progression. Although there are many options including laser surgery, eye drops, other surgical procedures etc, we are not discussing them here because they are not natural. Othtalmologist can explain you all these options if you choose to do so. If you have severe pain or rapid vision loss - it is the best option to go to the doctor because by the time methods listed below start to kick in you might have already very damaged eye. Ether you decide to put your health into the doctors hands or not, if you have glaucoma that progresses slowly, methods below will stop deterioration of eyesight, clear drainage channels, reduce intraocular pressure and return beauty and clear vision back to your eyes. These methods will help, by how much - all depends on you. It is going to take time, so if you are lazy and/or don't want to sacrifize your time or your lifestyle - these methods are not for you, go to the doctor. It usually takes years of bad habits and poor nutrition to destroy your eyesight, prepare for hard work to stop the damaging process. The glaucoma treatment itself is not exhaustive and brings pleasurable experience to the person that has decided to treat glaucoma. I understand that it sounds surprising, but this is the path that I walked through when I started research on natural glaucoma treatment options. I thought that if glaucoma is caused by the elevated pressure in the eye the first aid to the eye would be to reduce the amount of pressure. 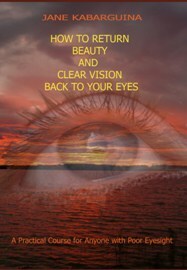 Watch the video with Relaxation Eye Exercises to learn at least half of them. They are all easy to learn, quick and fun to do. The biggest help for the eyes with glaucoma eye problem is water procedures. Learn about contrast eye bathing, eye icing, eye rejuvenating procedure and incorporate these easy tasks into your glaucoma treatment plan. Here is one of the yoga methods to fight intraocular pressure. Each morning or more frequently go to the bath, open the cold water in the sink, fill your mouth with cold water and, while you hold water inside, splash your eyes with running cold water. This stimulates blood flow in the eyes and releives the pressure. The last, but not the least is nutritional advice. Most people, especially with low-tension glaucoma, have also other vascular problems. They are usually due to poor eating habits, lack of vitamins and minerals. Read carefully about herbal medicine, particularly about schizandra and bilberry. Vitamin C, taken in dosages up to bowel tolerance, is reported to reduce pressure within the eye and restore collagen balance. Vitamin C supplements with bioflavonoids, especially rutin and lutein, are particularly recommended. Add schizandra into your tea. Drink plenty of green tea of good quality. Make green or white tea out of loose tea leaves. I just want to mention that just the month of following to this advice made the woman that decided to test my methods on herself run to me with open arms and tears in her eyes. She said that this is the first time when something is really helping, not counting many other emails I keep receiving.